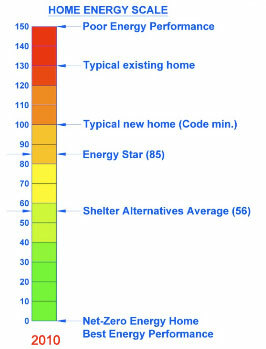 HERS Rating Lowest Yet for Shelter Alternatives, Inc.
Local design build team Shelter Alternatives, Inc. recently received notice from the certification agency EarthCraft Virginia that a new home Shelter built in Floyd this year received an energy rating 61% lower than required by current energy code. The 1.5 story custom brick home, designed and planned in partnership with the owners and local architect Melissa Obiso, reached a new level of efficiency for the company, showing that properly applied building science principles translate to lower energy bills and greater comfort for homeowners. Having made a 100% commitment to Energy Star standards, the design build team at Shelter Alternatives completes all new homes to surpass the Home Energy Rating System (HERS) score of 85, which is 15% more efficient than current energy code requirements. Annually, their homes average a HERS score of 56. The new best rating of 39 exceeds expectations, bringing the potential of a net-zero energy use home into view for our community. In 2011, Earthcraft VA recognized Shelter Alternatives, Inc. for building this Floyd home - the 3rd most efficient new home certified in Virginia!